Thoughts on the spending increase rate or the shut down? Bearing in mind, of course, that we are a much bigger country than we used to be. Think about your personal spending chart. Do you spend more money than you did when you were five? Is that necessarily a bad thing? I have a wife, 3 kids, a dog and a cat, so yes I spend far more than I was when I was 5, 30 or 40. Relative to my income. No. I am actually spending far less. My savings are compounding even while I maintain a savings rate from normal income. When I reach my declining years this may reverse somewhat, however I keep hoping for the sake of my daughters that the USA is not reaching its declining years just yet. By the way, I started in ~1950 since WWII was over and many consider that a good time for our society. And that's basically it. the country has roughly 50 percent more people than it did in 1980, and so it's not surprising government spends more just as you do. As for the declining years thing, this is the real problem we are facing as a nation. We are becoming less productive, while our costs are going up. Nobody caused this except maybe the Japanese when they bombed Pearl Harbor, that's just the way things are. Would you be surprised to learn that DogGone has gone round the bend, with unproven assertions, imputed motivations and a general rant without substance? The point isn't that we are spending more. Simple inflation and economic growth would account for that. Looking at MN state spending, inflation and population growth account for only 10% of the spending growth since 1960! 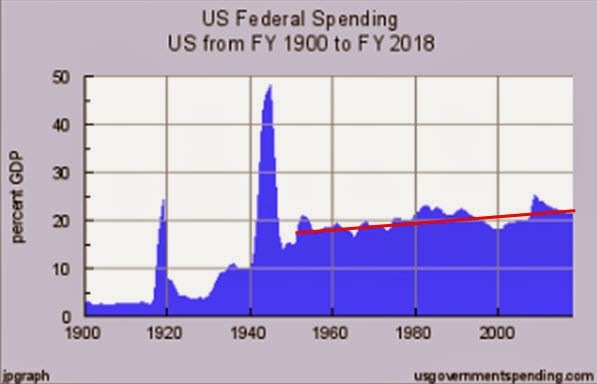 Federal spending is similar. The point is that we are spending a higher percentage of our national income and, worse, that we are borrowing about 1/2 of that spending money with no intention (or ability) to pay it back! You can't do that in your household. It's not sustainable, period. And Grace Kelly is even wronger. Absolutely friggin' delusional. Almost as if she got some bad Koolaid. 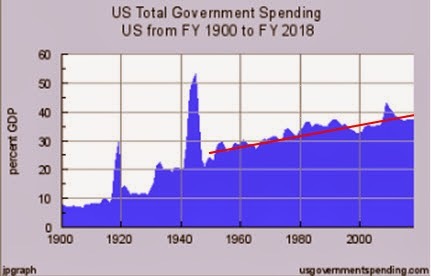 The problem isn't that government is spending more due to additional population, inflation, time, etc. It is that the government is spending a larger and larger portion of our GDP. Meaning that we individual citizens have less free choice as to where the money is spent. Though you are correct that both the spend rate and GDP growth rate are factors. It is that the government is spending a larger and larger portion of our GDP. If that's the case, why is government smaller than it used to be? Apparently those Public Employee Unions have done their job very well, and the Public Employees are likely compensated significantly better than they were. Likely better than the same personnel would be compensated in the Private sector. Remember I think the Public Sector is the only sector in which Unions have grown. Apparently us tax payers are the only ones who can afford the extra costs they incur. Also, my guess is that "wealth transfer" has increased over the last 60 years. Both in number of recipients and cost per recipient. And this is only going to sky rocket soon unless benefits are brought in line with the premiums that were paid. The Federal government now employs fewer people that it did in 1980 despite a roughly 50 percent growth in population. 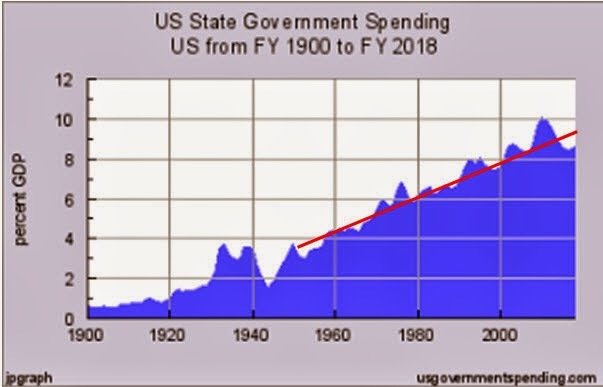 If government is growing, why is federal spending a problem? Now you notice that the Federal Government still employees 4,403,000 people... That is about 2% of the adult working population. I know the military, post office, FBI, Marshals, etc are a good chunk of them. But who in the world are the rest? If the debt is a crisis that requires immediate action, then everyone should chip in and pay for it -- including today's seniors, who were in large part responsible for the policy choices of the last few decades that got us into the mess. After all, it's hardly fair to make our children and grandchildren pay for our faults. As I have proposed before, I would like to get rid of Social Security and Medicare, and have the Savers/Wealthy pay their way until the money runs out. And the non-Savers would go on welfare/medicaid at retirement age. Of course the savers who paid in don't like this idea because they want "their" money back. And Lord knows it would be difficult for the Liberals to get us Savers to pay a payroll/welfare tax for non-savers. It's easier to make everyone pay the same, and limit/tax the benefits of the Savers. That way everyone thinks it is not a wealth transfer system. G2A SS and Life Expectancy"
I forgot. Also, remember those dreaded Bush tax cuts that the Democrats vilified. Yet they continued most of them during the Fiscal Cliff compromise. Not even they were silly enough to let the poor and middle class go back to their higher taxes. That may have been the responsible thing to do for our kids, however it would likely have cost them votes in 2014. One of the many iterations of Social Security Reform touted by non other than our own Sen. Rod Grams was called "Promises Made, Promises Kept." And that's really the solution here. It took us 40 years to get into the depths of this Ponzi scheme that is SS, and it might take us 40 years to work our way back out, but we can do it without breaking the bank OR our promises. It's some variation (math adjusted to reality) of the following: If you are 55-67, you continue to pay just as you are now, and you get everything you were promised in SS benefits. 45-54, you may (optionally) divert 1/3 of your money into a private retirement account. 35-44, you get 2/3, and below 35, it all goes into your private fund. SO, in 30 years, when the X generation retires, SS owes them nothing, and the people who were drawing full benefits are no longer drawing them (if you know what I mean). It works and the problem of the trust fund and the massive "unfunded liability" of SS simply goes away. More of the X generation believes in UFOs than believe that SS will "be there" when they retire, so why not allow them to opt out? I've got a better cute baby picture, and the caption reads "Her share of the national debt (and unfunded liabilities" is $390,000 and she can't get a job. How about YOU?" With this plan, how does social security provide the promised benefits for "those still around" with even fewer people contributing? The math seems flawed. Also, what will we do with the "non-savers" when they are old? It seems our culture is too compassionate to let them reap what they sewed. I mean that is why social security and medicare were created in the first place. It seems forced insurance and retirement makes good sense for a society. The primary problem is that the "premiums" are too low and/or the "benefits" are too high. Increasing the payroll tax rate and/or reducing the benefits for everyone would be the correct way to fix the system. Reduced benefits would mean delaying the retirement age, cutting the size of everyone's checks, etc. Unfortunately the Liberals seem to want to turn them into a "stealth welfare system". They would have the well to do pay much higher premiums while forcing them to receive much lower benefits. (ie no payroll wage cap, taxed benefits, smaller benefits for "savers", etc) This is why I think if that happens we should just call it what it will be, another "wealth transfer" device. I know it doesn't seem like the math pans out, and certainly by protecting benefits for those 55 and over we are going to be losing money. We should have started this 10-15 years ago when it was first proposed. Until we start seeing the first folks getting reduced benefits (and with higher personal savings) retire, though, our options are exactly what they are today, meaning that money will come out of the general fund to redeem those "trust fund bonds" and pay benefits. There is no CASH in the trust fund, and never was. Notice also that people are also investing only their own portion of the SS tax. Employers will continue to pay in to the system at full value, largely sustaining it. As people retire with smaller benefits, those getting full benefits "leave the system" reducing payouts still further. 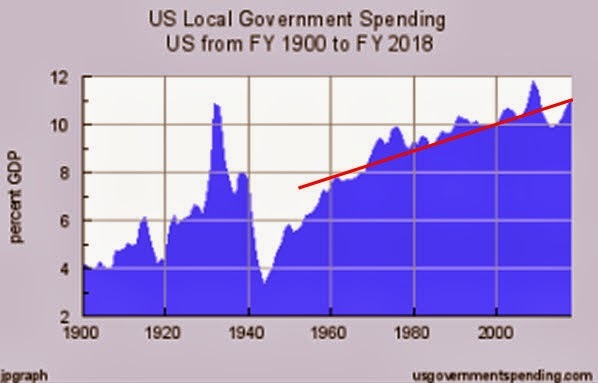 The math DOES work (perhaps with a bit of tinkering), the only difference is that the fictitious "trust fund" is depleted a bit earlier and the obvious "welfare" aspect of spending general fund money on those false promises becomes obvious. The "non-savers" problem is easily solved. The diversion to private accounts is optional; people can stay in "regular" SS as long as they want and take their chances. If they opt for the private account, they MUST invest for their retirement. People, even Republicans, keep talking about raising the retirement age, and to me that is breaking promises in the worst way. What do you mean, I have to work 5 more years? Heck, people have trouble finding jobs now and it's only going to get worse. The original idea of SS in the first place was to free up employment slots for the younger people. Go to private accounts and people can (eventually) start retiring any time they darn well please. Their private investments will certainly do better than any "return" they will get with SS, even if it survives. It kind of sounds like you want Social Security to become a mandatory "401K like tool" where people have an actual balance and the freedom to select different levels of risk. By the way, the SS retirement fund is the least problematic of the 3 entities. SS disability and Medicare are much worse, how would this be addressed? I suppose, if you want to call it that. I think of it more like an IRA, where you don't pay taxes on what you put in (they ARE your SS taxes) but you shouldn't have to pay taxes on withdrawal, either; you don't pay on your "base" SS checks. SS Disability is a welfare program, and should be called that. Separate it out. Medicare is a whole different kettle of fish but with the similar problem of overpromise, but added to that is the goshawful distortion of the health care marketplace. The solution, quite simply, is to get government out of the health care business altogether (OK, except for a tiny few health and safety regulations) and let people take their premiums (perhaps subsidized for a time as a welfare program) and buy their own, personal policy. How to Buy American? Why? 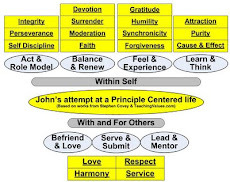 Punishing the Unsuccessful / Unlucky? Obama: My Way or Else !! !